October 29th was a wild and blustery day. Our four-year-old Ruby had a field trip at a pumpkin patch about an hour’s drive from home, and parents were requested to join them. As Ruby and I set out in the morning, I noticed that the intermittent contractions I had been having for about a week were coming a bit stronger and with a little more regularity. My due date was still several days away, and I’d had a few false alarms, so I didn’t think too much about it as we drove out to the country. There is something wild and magical about a pumpkin patch in late October. This big wide expanse of land with lots of dead looking reedy vines twisting around on the ground is punctuated by an occasional bright orange glowing orb. It feels like a moonscape in an alternate universe. The field stretched out under a dramatic grey sky, and I felt I could understand why these bizarre yellow fruits held such a place of stature in fairy tales. The field trip included the obligatory hayride. And it was a bumpy one. Ruby struggled to sit on my lap, what was left of it, and then just gave up and sat next to friends instead. I had been casually timing the contractions and noticed that they were coming about every 8 to 9 minutes for an hour or two and occasionally getting more intense. At the end of the ride, one of the fathers offered his hand to help me out of the truck but I said I’d wait. I didn’t tell him it was because I was right in the middle of a pretty strong contraction! By the time 3-hour field trip was over, I was thinking that I might now be in real labor. One of Ruby’s friends was having a pumpkin carving party, so I sent her along and went home. My partner was at work about an hour away and I hesitated to call him home in case this wasn’t the real thing. 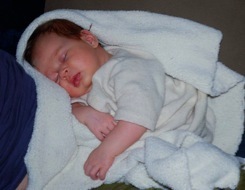 I called our midwife Erin, who told me to take a nap and check back with her. I rested as best I could, not really sleeping, and when I got up I called Ben and let him know it was probably time to come home. I spoke to Erin and Mairi on the phone a few times during these hours. I was feeling very quiet and focused and didn’t want to talk much. When we all felt it was probably time for them to head over, it was full on rush hour and we live right in the city. I wanted very much to get in the tub and so relieved when it was ready for me. Mairi, Erin and Susan (who was assisting them) were all on their way, and everyone else had cleared out other than Ben. The tub felt wonderful and I felt the baby and I were ready to get serious. When Mairi arrived a few minutes later I was already pushing. Ben went to get the rest of Mairi’s equipment from her car while she stayed with me and quietly set up. She told me I might want to hang on until he came back. Ha! This baby was on her way. There was no way of holding her back. When Ben came back in a few minutes before Susan arrived, I could reach down and feel the baby’s head on its way. I wanted to get out of the tub and use the birthing chair, but the contractions were coming so close to one another that I didn’t get enough of a break to climb out. Susan asked, “Are you going to have your baby now?” I nodded. She said “Reach down and catch your baby,” – which somehow hadn’t occurred to me. One more push and her head was out. But then she stayed there, under the water, with just her head out and the rest of her still inside me. The contractions had been coming quickly, with one almost immediately following the next for several in a row, followed by a break for a few minutes. Then the whole cycle would start again – several contractions in a row followed by a nice break. This last series of contractions had resulted in the arrival of the baby’s head, but then my break in contractions arrived. Mairi told me to push hard to get the rest of her body out, but with no contraction behind it my pushing didn’t do much. They told me to stand up so that the baby’s head would be out of the water. Up until that point I had been on one knee, leaning against the side of the tub. They helped me to stand up. I put my hands against the edge of the pool, moved my hips around which seemed to loosen the baby’s position, and with the next contraction Maeve Chaim Luzzatto arrived.Someone (Susan I think?) caught Maeve behind me as she arrived, and then there was the most interesting problem of how to get us together from there. Ben had done a great job of filling the tub and the water was quite high. I was facing the side of the tub and Susan was holding Maeve behind me, with the umbilical cord still connecting us. Finally I turned around, stretched my leg way up to get over the umbilical chord (thank you yoga), sat back down in the water and was handed my baby. Maeve was very healthy and very loud. As Erin arrived and walked to our door she could hear the baby crying from inside. Maeve and I stayed in the tub for a little while, enjoying the warm water as she nursed for the first time. 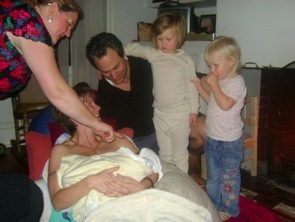 The midwives covered her with a towel and periodically poured more water over it to keep us warm. Then we were helped out of the tub and settled down in a lovely nest of blankets and pillows the midwives had created for us next to the fire. 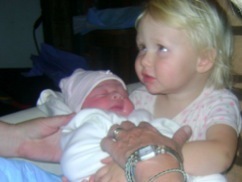 A short time later, Ben’s sister returned with Ruby and Emerson who were sleepy but excited to meet their new sister. After I delivered the placenta, Mairi sat by us and examined it, holding it up for all to see and giving the girls a biology lesson by the light of the fire. Erin was so sweet with Emerson, and set her up on the couch supported by many pillows so she could hold her brand new baby sister. Mairi helped me upstairs to take a shower and get us all settled in bed. We weighed Maeve and discovered to our surprise that she was nine and a half pounds! The midwives had done all their checks of the baby and me, and were ready to leave us. They warned that even though this had been an easy birth, I would still need to take it easy. They knew that I would be tempted to do too much. They were right of course, but it helped to have their advice in the back of my head for the next few days. Maeve and I snuggled together in our bed on the third floor, looked out the skylight and watched the leaves change colors together.